A new fence gives your home a complete look. As you prepare your home sale to-do list, you’ll go from room to room trying to determine which walls to paint, which nail holes need heavy duty help, and whether or not to upgrade kitchen appliances or cabinets. While you’re probably focusing on what you can do around the house to increase your property value, you might be forgetting that some of the most valuable upgrades are things that you can hire someone to do. One of the easiest upgrades with fantastic bang for your buck? A new fence. Before someone notices the new carpets you installed or the beautiful tiles in your shower, they notice the outside of your home. It’s up to you to make sure that the very first impression prospective homebuyers get is the best that it can be. 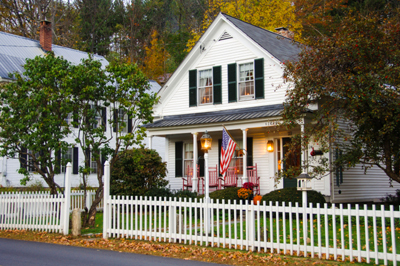 At Hercules Fence we can build you the perfect fence to accent your yard, whether it’s the white picket fence of your dreams or an ornamental aluminum fence that looks right at home. When homebuyers are considering multiple homes in different neighborhoods, one of the most important things that can influence their final decision is the perceived safety and security in each home. The house directly up the street from a park with graffiti and the stylish modern house that’s a little too close to downtown are going to be crossed off the list—unless the homeowners invest in a fence. Fences serve as physical and psychological barriers to would-be solicitors, potential thieves, hungry deer, and destructive groundhogs. Homebuyers also enjoy a feeling of privacy, especially in the backyard. No more worrying about your kids running over and interrupting your neighbor’s cookout (or vice versa). Beyond the value of increased peace of mind, a fence adds literal value to your home’s property value. The money you invest in a fence will come back to you in the associated increase in resale value or property value. If you already own a fence, consider getting it repaired so that it matches all of the hard work you put into your landscaping. Nothing throws off a perfectly manicured lawn like a fence with chipped paint and missing boards. If you don’t own a fence yet, consider incorporating one into your landscaping design to raise your home value by thousands of dollars. Ready to Boost Your Home’s Value? Hercules Fence has been providing homeowners with quality fences for over 50 years. We are well equipped to meet your needs, whether they are residential or commercial. Contact us to see how a fence can increase your property value by giving us a call at 703-551-2609 or visiting us online. To see examples of our work, follow us on Facebook, Twitter, Google+, LinkedIn, Pinterest, and Flickr. This entry was posted on Friday, June 10th, 2016 at 2:47 pm. Both comments and pings are currently closed.